ECDI Founder and CEO sat down with IFF, the largest CDFI in the midwest to discuss ECDIs growth in Ohio. This year, there will be a host of free events available to veterans who fall into these categories. JPMorgan Chase Foundation target nine core neighborhoods in Cleveland, Columbus and Cincinnati, in collaboration with local organizations. Funded by the JP Morgan Chase Foundation, OH3C will target nine core city neighborhoods within Cincinnati, Columbus and Cleveland. The shared community mission is to emerge as inclusive communities that provide housing choices for people at all income levels, as well as thriving business districts. JPMorgan Chase has announced the OH3C Collaborative, a $3 million, three-year grant to fund a collaboration between four of Ohio�s strongest community development financial institutions working across Cincinnati, Columbus and Cleveland. Cousins Army Navy and Survival Supply Returns to University District! ECDI is excited to work with this long time staple of the Columbus community! ECDI receives $200k award to support small business! Microlender ECDI gets grant to continue helping minority owned businesses! Thanks to the Wells Fargo Diverse Community Capital Award, ECDI can continue its mission! Economic & Community Development Institute has deepened its commitment to diverse hiring and microlending to minority-owned, and specifically black-owned, small businesses. WBC of Ohio welcomes Ramona Mills as Director! The WBC Welcomes Sabra Kershaw as Board Chair! Sabra Kershaw has been elected Board Chair for the Women's Business Centers of Ohio! The WBC Expands to Cincinnati! The WBC brings access to capital to women in Cincinnati! Congratulations to our Executive Director, Danielle Sydnor! Executive Director of Northern Ohio has been named one of the YWCA's Distinguished Young Woman Awards! ECDI is expanding the Food Fort! 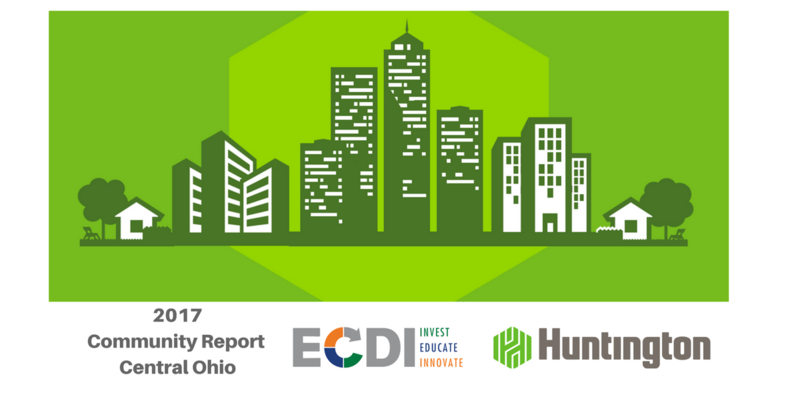 Huntington National Bank Highlights ECDI! As part of their ongoing commitment to community reinvestment, Huntington National Bank spotlights the work of ECDI and our clients in their annual report! Spread the news about your business! SBA Columbus District Office Supports the WBC! The WBC is here to support women in all aspects of business, through coaching, training, and financing! New pet ambulance serving the Cleveland area! ECDI and WBC member Yolanda takes her passion for animals, and brings peace and security to pet owners in Cleveland. ECDI works to provide entrepreneurs with the capital they need to grow a business. Jerzell Pierre-Louis uses her entrepreneurial skillset to benefit young lives. Sima Arshadi came to America as a refugee, and took her love of art and turned it into a business. ECDI client Julie Wilkes, used her second chance at life to start a health and wellness business! How are large chain grocery stores adapting to the 21st century? Meet Central Ohio's Bankable Restaurateur! Brad Hobbs takes on the restaurant world in Columbus! The Cleveland Foundation Spotlights ECDI's ENCORE Program! Did you know that women over the age of 50 are one of the fastest growing groups of entrepreneurs? YWCA Pics 7 Women of Achievement Winners! Economic & Community Development Institute (ECDI), in partnership with JPMorgan Chase & Co., recently launched a new program titled �Capital For Construction� that addresses financing gaps minority-owned construction subcontractors face when submitting bids for large-scale construction contracts. ECDI's MBE program to address financing gaps for minority-owned subcontractors. One of ECDIs most admired employees, James brought an infectious energy and dedication to his work environment that left a lasting impression on anyone that was fortunate enough to cross paths with him in life. The City of Columbus needs your help in a study to determine whether local, Minority and Woman Business Enterprises (M/WBE) have had equal access to contracting opportunities. Your participation in this short survey will provide valuable information that will be utilized for the Study. ECDI is excited to partner with the City of Cleveland on promoting economic development! Read the inspiring story of our client Walid Ali! Ohio Women-owned Businesses start and grow with help from the WBC! The WBC in Northern Ohio is doing incredible work with female entrepreneurs in the Cleveland area. One of our partners, KeyBank wrote an in-depth feature on the triumphs of our WBC members! For over a decade, ECDI has proven that target neighborhood investments work. ECDI's success investing in small businesses has brought hundreds of job opportunities to neighborhoods like the Hilltop, Linden, and Weinland Park, spurring job growth in areas that need it the most. The WBC extends it's service footprint to Akron, moving into ECDI Akron's new location within the Akron Global Business Accelerator. ECDI Founder Inna Kinney encourages everyone to support immigrant-owned businesses. The Dealership, a Cleveland-based co-working space, brings entrepreneurs together. ECDI President Steve Fireman reflects on why he loves his hometown, offering insight on his personal tastes of the city, as well as the dynamic environment it creates for business, both large and small. ECDI Cleveland debuts The Dealership, a co-work, event and office space for entrepreneurs, freelancers, creatives, and small businesses. Ohio acts as a beacon for refugees due to its excellent resettlement agencies across that state. ECDI continues to serve the local refugee communities through its services provided, enhancing the lives of those fleeing in times of strife. The Economic & Community Development Institute will increase its lending capacity to serve Ohio's small business owners while also making enhancements to the Food Fort, ECDI's food-based business incubator. The Economic and Community Development Institute reported that it made more than $530,000 in loans in the second quarter of 2016 to 21 Cleveland-area businesses. The Path of the Legend will bring the community together for one night in the Columbus Museum of Art to explore the inspiring stories of legendary, leading and emerging entrepreneurs across industries. Register today at http://startupstorytellers.com/. For the third year in a row, ECDI is the best Small Business Resource in Columbus! ECDI is honored to win The Metropreneur's "Best Small Business Resource in Columbus" for the third year in a row! The ECDI family, including staff, generous funders, partners, and most importantly, all the local entrepreneurs who've come through ECDI's doors, have helped ensure ECDI's success. Cuyahoga County and the Cleveland Foundation are putting nearly $2.2 million into a county loan program run by the Economic & Community Development Institute, a Columbus microlending nonprofit with a growing presence in Cleveland. We are excited to receive funding from JP Morgan Chase & Co. to support our on-site small business acceleration programs. Chris Faircloth, ECDI Akron Relationship Manager, discusses ECDI's success in the Akron Market. A great resource for our clients. On May 14, The Food Forts campus was transformed into a culinary battleground, pitting three of Columbus' best-kept southern-style secrets against each other in The Food Fort's first-ever Fried Chicken Throwdown. Rebecca Mayhew, Relationship Manager at ECDI, discusses the refugee population in Cleveland and the demand for Capital. The City Of Columbus is ready to unveil its pilot program that will finally grant food trucks & carts access to a number of coveted, city-owned spots. COLUMBUS, Ohio – Five contestants in the 2015 InnovateHER business challenge will compete for a chance to win $30,000 in prize money at 6:00 p.m. Monday, March 23, 2015, at the Economic & Community Development Institute’s Fifth Third Bank Learning Lab, 1611 Old Leonard Avenue, Columbus, Ohio 43219. Blu Olive's pop-up reinvents the way people think about pop-ups! The John S. and James L. Knight Foundation announced today that the Economic & Community Development Institute (ECDI) will receive $250,000 in new funding for their Akron Office which opened in November 2014. ECDI was once again voted best small business resource in 2014.